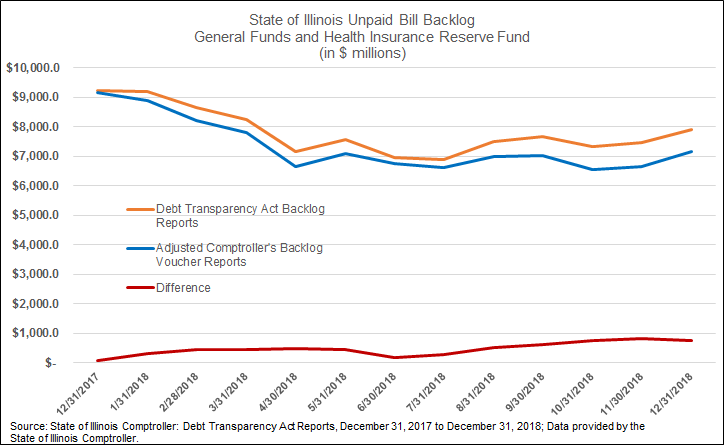 During this decade of financial difficulties, the State of Illinois’ backlog of unpaid bills has become an important indicator of its fiscal condition, relied on by policymakers, rating agencies, taxpayers and journalists. Now two different ways of measuring the backlog have begun to diverge. One showed the backlog at $7.91 billion as of December 31, 2018. The other measure indicated a backlog of $7.15 billion on the same date. The $755 million discrepancy relates to employee health insurance bills, which have been a major component of the State’s delayed payments for many years. Backlog numbers from both the Illinois Comptroller’s Office and the Governor’s Office of Management and Budget (GOMB) have included bills owed from General Funds, the accounts used to pay the operating expenses of most State agencies, school funding obligations and pension contributions. These bills could be held at an agency, waiting for sufficient appropriation authority, or sit at the Comptroller’s Office due to inadequate cash or because other payment requests have higher priority. The backlog numbers have also included bills held by the Department of Central Management Services (CMS), the agency that pays for employee health insurance from another account. The Health Insurance Reserve Fund, known as HIRF, is funded primarily by transfers from the General Funds, so these transfers are netted out to avoid double-counting in the backlog calculations. Most discussions of the State’s backlog refer to the Comptroller’s Backlog Voucher Report, which is updated daily. For example, a February 5, 2019 report on Illinois’ financial challenges by Moody’s Investors Service used a backlog number from the Comptroller’s website. GOMB’s Summary of Estimated Bills Outstanding is a monthly report that is published with a lag; the report currently posted on the website is for November 2018. The Debt Transparency Act, championed by the Comptroller’s Office and enacted in November 2017, required more comprehensive monthly reporting by agencies on their bills. As discussed here, the new law also provided the first detailed public information about late-payment interest penalties owed by the State. Since January 2018, the Comptroller’s Office has posted monthly reports based on the data supplied under the Debt Transparency Act (DTA). The DTA reports introduced a revised approach to health insurance bills: in addition to health insurance bills held at CMS, they included health insurance bills sitting at the Comptroller’s Office. This difference is described in notes on the monthly reports and on the Backlog Voucher Report. However, it did not become noticeable until health insurance bills began to pile up at the Comptroller’s Office. In January 2018 the difference between the two numbers was $85 million. It widened to $820 million in November 2018 and declined slightly to $755 million in December 2018. A new report from Governor J.B. Pritzker’s administration uses the DTA number of $7.9 billion to indicate the size of the backlog when he took office in January 2019. The chart below shows the difference between the two sets of numbers from January 2018 through December 2018. It should be noted that the Voucher Backlog Numbers in the chart are adjusted by the Comptroller’s Office to reflect the monthly agency backlog reported under the DTA. These adjustments do not appear on the Comptroller’s website. Group health insurance bills climbed during the State’s budget impasse in FY2016 and FY2017, when the program received no general operating funds. About $4 billion from the $6 billion sale of backlog bonds in October 2017 was used to pay down group health bills. As a result, the amount of unpaid health insurance bills declined to $1.6 billion at the end of January 2018 from $5.2 billion in October 2017, according to a report by the Illinois General Assembly’s Commission on Government Forecasting and Accountability (COGFA). Although health insurance received General Funds appropriations in FY2018 and FY2019, a backlog remains from before the budget impasse. Unpaid health insurance bills at the end of FY2019 were estimated at $1.4 billion in Governor Bruce Rauner’s last budget proposal.